" KidSpeak Korean is a language–learning breakthrough that makes learning Korean easy for kids of all ages. Animation, fun activities, interactive games, puzzles, and songs make up this award-winning educational software program." 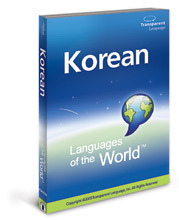 " Korean - Languages Of The World (transliterated) (windows download)"
Learn thousands of words in Korean quickly and easily with countless activities and games. Dialogs with native speaker audio, pronunciation practice, and advanced speech analysis will have you speaking Korean in no time. Windows Only. Korean Byki Deluxe will teach you the most important Korean words and phrases on your computer, iPhone, iPod, and any MP3 device! Enjoy an easy, addictive, and lightning-fast 3-step process. Play games, perfect your accent with native speaker sound, test yourself, and take your learning with you on MP3 audio. Know It Forever! Guided activities explaining aspects of Korean grammar from a discourse-pragmatic perspective. Designed for high-intermediate / advanced learners and heritage speakers. Each unit can be used as supplemental materials or for self-study. Available in PDF format for the publishers website. "Modern Korean breaks new ground in the field of Korean studies by providing students at last with an intermediate-level language text. The volume emphasizes the development of reading proficiency, but the exercises reinforce skills learned through conversation practice. They use a communicative approach emphasizing student-student and student-teacher interactions in real-life scenarios. Twenty-four lessons are divided into two groups of twelve lessons each. A single lesson consists of a main text, written in expository or descriptive prose that often incorporates a conversational style; a dialogue; a discussion of new word usage and structural patterns; substitution and grammar drills; exercises; and a vocabulary list. The second half of the book introduces Chinese characters found in each lesson. Modern Korean may be used for classroom instruction or self-study. Main text topics cover a wide range of subjects including Korean history, geography, holidays, literature, customs, and people, allowing students to develop a better understanding of Korean society and culture while improving their language skills. " Hit a roadblock with your Korean? Tired of memorizing long lists of Korean words? How to Master Korean Vocabulary introduces a unique method for learning thousands of Korean vocabulary words, simply by linking one Korean syllable to one English sentence. The book includes more than 300 mnemonic devices that teach you the most commonly used Sino-Korean characters (Hanja). 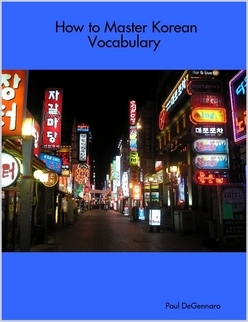 Expand your vocabulary exponentially with How to Master Korean Vocabulary. Making Out in Korean: From Everyday Conversation to the Language of Love--A Guide to Korean as it's really spoken! Making out in Korean is your guide to the living language. It will help you successfully navigate your way through the colorful Korean social scene. In 13 easy chapters you can learn how to meet people, make friends, and dine out. With the phrases in this book, you'll be able to hold your own anywhere, from bustling train stations and crowded provincial markets to Seoul's fast-paced restaurant, bar, and club world. No grammar drills! No complicated language rules! No long word lists! Making out in Korean avoids the flamboyant linguistics of the highly formal language taught in schools and universities, offering instead the plain and candid language of the average person on the street Whether you trek through South Korea or venture onto the unbeaten paths of North Korea, Making out in Korean will give you the words you need for polite conversation, intimate encounters, and even rough-and-tumble situations should such occasions arise. "Approach to the Korean Language: Historical, Literary, and Cultural was written in an attempt to fill the need for a scholarly method for learning to speak, to understand, and--above all--to read Korean. While daily conversational ability is not ignored, this book, as the title indicates, is primarily concerned with presenting the language in its cultural context. This introductory volume presupposes no knowledge of the language. After pronunciation and writing systems (both the Korean alphabet and the use of Chinese characters) are introduced, grammar is systematically presented and drilled through lessons whose text passages concern Korean history and cultural traditions. An answer key to the exercises is provided so that students who purchase the accompanying cassettes can use this method to study Korean on their own. "